New York (TADIAS) – Last weekend in Alexandria, Virginia Dr. Lemma Senbet, renowned Ethiopian American economist and professor, attended the 8th year anniversary celebration dinner hosted by Your Ethiopian Professionals (YEP), a D.C.-based organization dedicated to promoting career networking and mentoring opportunities for members of the Ethiopian American community. Dr. Lemma was keen to share the current effort of the recently formed Ethiopian Diaspora Trust Fund to YEP’s program attendees as part of the Fund’s upcoming launch of a D.C. chapter to help accelerate the global donor campaign. 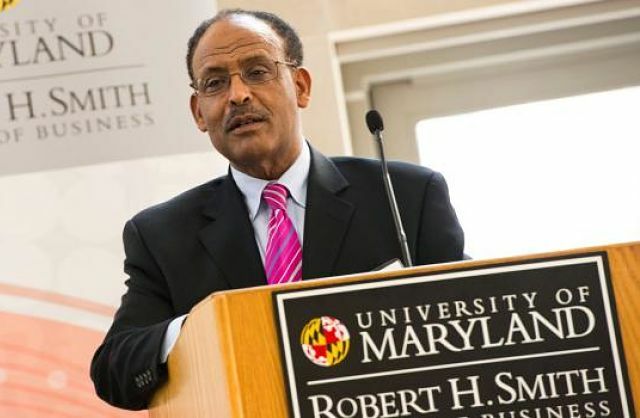 Dr. Lemma W. Senbet, who is currently the William E. Mayer Chair Professor of Finance at the University of Maryland, College Park and the former head of the African Economic Research Consortium (AERC), is also one of the Advisory Council members for the Ethiopian Diaspora Trust Fund. “We are in the process of forming a chapter,” Dr. Lemma said in a recent interview with Tadias, noting that several members of the Advisory Council from the D.C. area had recently met to discuss the effort and to come up with formal guidelines on the process of establishing a chapter. “In between, what we are doing is engaging in a number of retail activities piggybacking on and leveraging various events that are being held by the Ethiopian Diaspora, such as the YEP event.” Dr. Lemma added that chapters will be viewed as an extension of the Council. “So it’s important that it is done with care, so it will not engender any reputational risk” he shared. “We have some guidelines, but not too restrictive so it will not discourage chapter formation,” Dr. Lemma said, which has been reported back to the Council. More importantly, the Fund has the responsibility of following U.S. laws governing charitable organizations for nonprofits designated under section 501(c)(3) of the Internal Revenue Code, which is how EDTF has been established. One thing that EDTF has yet to do is engage in “systematic campaign activities,” Dr. Lemma told Tadias. This would include events such as “holding town hall meetings and press conferences not only in Washington D.C. but worldwide.” To that end in Washington a press conference on the Fund and mobilization of the process will be held later this month at the Ethiopian Embassy, and a major fundraising event is also in the works for early 2019. As part of the final implementation of projects Dr. Lemma said that they will host “a number of discussion forums” around the world. Dr. Lemma considers it a good thing that the current Advisory Council is comprised of a “talented bunch” and that the members involved “are navigating together” a complex set of international regulations and rules spanning several continents. On a personal level Dr. Lemma said that he sees his involvement with EDTF as a once-in-a-lifetime opportunity to make a real difference in Ethiopia. You can learn more about the fund and contribute at ethiopiatrustfund.org.